Four outstanding athletes, three in football and one in baseball, have been selected for induction into the SHSU Lettermen Association Hall of Honor during 2004 Homecoming activities Oct. 16. Selected were running back and receiver Tony January of San Antonio, third baseman Terry Pirtle of Longview, running back Luther Turner of Lufkin, and offensive lineman Murphy Yates of League City. The induction banquet is at 11:30 a.m. in the Lowman Student Center Ballroom. Tickets are available from Jack Kyle, Lettermen Association secretary/treasurer, at 936.295.5953. Tony January was a track and football star at West Orange High School before coming to Sam Houston State in 1978. 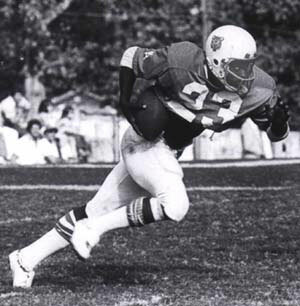 At SHSU he compiled a number of record-book efforts in running, catching passes, and kickoff returns. January had touchdown runs of 81, 80 and 73 yards, all top 25 marks in that category. His career rushing yardage is 2,376, third highest in team history, and receiving yardage is 1,328, seventh highest. His touchdown pass receptions of 93 and 84 yards are among the top seven, and a 94-yard kickoff return also ranks seventh. January's honors include NAIA all-America in 1979 and all-Lone Star Conference in 1978-79, and 81. He is an independent shoe retailer in San Antonio. Terry Pirtle played baseball, football and basketball at Pine Tree High School in Longview, settling on baseball at Sam Houston State, from 1984-87. 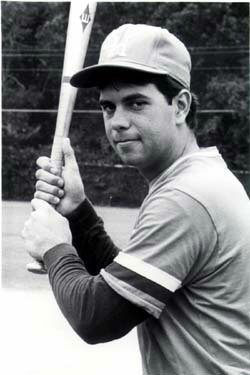 He was an all-conference third baseman in 1986 and 87 and all-America selection in 86. Pirtle is the Bearkat record holder in games played in a career (224), career at bats (753), longest hitting streak (34 games), and is tied for first in games played in a season (62) and hits in a game (5). He is second in season batting average (.411), fourth in career batting average (.360) and second and third in hits in a season (85, 84). The teams on which he played were 166-65, and went to three NCAA Division II regional tournaments. He now coaches at Pine Tree High School. Luther Turner played football at Lufkin High School and Navarro Junior College before transferring to Sam Houston State in 1985. 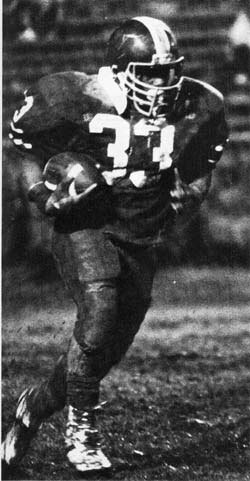 In his three years the bruising 5-8 running back set a number of records and earned high athletic honors. Turner is the Bearkat career leader in rushing touchdowns in a season (20) and a career (35). His 120 points are the most ever in a season, and his 210 career points are the second highest in that category. Four times he scored three touchdowns in a single game. His honors include all-conference in 1985 and 1987 and all-America in 1987. After completing his career at SHSU, he played four and a half years in the Canadian Football League for teams in Montreal and Ottawa. He is a heavy equipment operator and works with troubled youth in Lufkin. Murphy Yates played high school football at Dickinson, and was selected for the 1987 Texas High School Football Game. In his first year at Sam Houston State he started every game at offensive guard and was named freshman of the year. In Yates' sophomore year he was the team's offensive lineman of the year and all-conference. He was also all-conference as a junior. As a senior he was academic all-conference, lineman of the year, captain of the Southland Conference championship team, and first team all-conference and all-America. He is owner of the Harbour Classic Builders custom home building company in the Clear Lake area.